Another round of CEO Musical Chairs is being played at General Motors. When Daniel F. Akerson officially begins his tenure as GM's chief executive officer on September 1st, he will be the fourth person to sit in that chair in less than two years. Rick Wagoner stepped down from the position at the request of the United States government and was replaced by Fritz Henderson, who then resigned in December of 2009. Ed Whitacre took the reigns in early 2010, and now Akerson will replace him as both CEO and chairman of the board by year's end. But who is Dan Akerson? After all, most of us had never heard his name before this big announcement, and he must be awfully qualified if he's been offered the top-ranking position at one of the world's largest automakers. Akerson, 61, has been a member of GM's board of directors since July of 2009 where he worked closely with Whitacre. In addition, he currently serves as managing director for the Carlyle Group, a United States buyout firm, and is one of the directors at American Express. GM picked a successor for Whitacre who has had plenty of experience with business management. Akerson is the former CEO of Nextel Communications, a wireless carrier now owned by Sprint, as well as a former CEO of telecom services provider XO Communications. He was also appointed to GM's board of directors after the company emerged from bankruptcy reorganization last year. He may not be much of a car guy by our definition, but in terms of someone capable of running a major corporation, both Whitacre and the rest of the GM board of directors are confident that Akerson will use his years of experience to continue to reshape GM during this crucial time of restructuring. Godspeed, Dan. Yikes come on guys just pick someone and get it right! Stop this silly changing of the gaurd constantly. They have been moving/changeng upper managment constantly for two years. Just pick the right person pay them well and lets move on allready!!!! God darn it all to heck!!!! Since the government took over, no internal GM employee has been picked since Fritz left. As long as the GM board is filled with government appointees on the board of directors, we will see a steady stream of outsider CEOs. Sadly, car guys like Bob Lutz are few and far between. Hope lies with the IPO and getting rid of the remaining government debt. Once GM is free from the government, then there is room for a car guy to rise to the top spot. Lastly, outside CEOs will concentrate on profitability and efficiency. Most CEOs have not managed a worldwide coroproation with the size and scale of GM. So I suspect many outsiders find managing all the various business sectors extremely challenging and stressful. Asia, Europe, and North America all have different issues, profitability, and labor issues to deal with. Whitacre and Akerson don't appear to have much international management skills. I might be wrong. Time will tell. Oh lawds. Another beancounter to fock up GM. As said, he'll probably focus on making maximum profit, fit and finish of GM cars might fall again, cutting of corners, etc. These morons only seem to know how to make money, not make a quality product. managing director for the Carlyle Group, a United States buyout firm, and is one of the directors at American Express. this guy is going to do whatever he can in order to make money because thats where his entire background lies. he knows absolutely jack sh*t about cars. Appoint a CEO who knows wtf a car is. The CEO of GM should not be just some guy who knows how to make money for himself and companies. Someone tell me what qualifications he has to run a car business rather than simply having enough money to buy supercars. ^^^^ yea look where that got us with Obama running the USA! 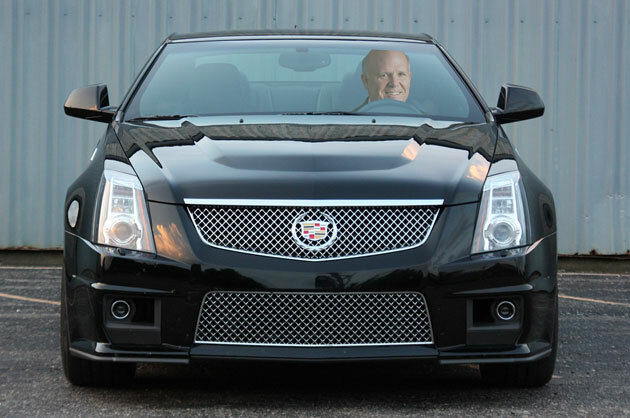 Dan Akerson: New GM CEO a car guy after all? The announcement today that General Motors will soon be welcoming its fourth CEO in just 14 months was startling news, but the real unanswered question is just who is Dan Akerson? We've already told you what his business chops are and it's clear the man can run a lemonade stand, but there's virtually no other information available out there besides his resume. And as for pics, the entirety of the internet has but one to offer, which is Akerson's glamor shot as a member of GM's board of directors. Flattering? No. Looks like a high school principal's year book picture. Well, we dug a little and found some interesting info on one Mr. Daniel F. Akerson. For one, he lives in McLean, Virginia and is reportedly an avid golfer. Ok, not too surprising, as most corporate executives can swing a club. How about this: He's said to be worth an estimated $190 million. Yeah, CEOing is a good gig if you can get it. Also, he currently drives a Cadillac CTS. Finally, we're told that Mr. Akerson's first car was an MGB roadster, which he quickly traded in for a 1970 Oldsmobile Cutlass. Now, we don't have confirmation on which Cutlass he had, and it makes a difference. The 1970 Cutlass was nothing special, unless you're talking about the 442, which was a legitimate muscle car. The fact that Akerson first had an MGB makes us hopeful that he is a car guy after all and that the Olds in question was the 442... or at least was powered by a Rocket V8 of some sort. Does the CEO of General Motors need to be a car guy? Not really. Ford CEO Alan Mullaly has never been considered a "car guy," which didn't stop him from righting Dearborn's sinking ship. Still, enthusiasts might take comfort in the fact that the man running one of this industry's most important companies knows his way around a four-barrel carb. And Dan, a little advice: Trade up to a CTS-V Coupe. What's $190 million good for if you're not going to use it? I ain't impressed yet with Akerson. The fact that he's already worth $190M just reminds me of the old Mel Brook's movie - History of the World - Part I, and the line "it's good to be the king!". I am not too worried about quality slipping. Quality is a daily operating philosophy at the employee level. The poor fit and finish of the 70s and inability to keep paint on certain cars and trucks in the 80s are long gone. Fit and finish, quality, and performance are mandatory just to get a potential customer into the show room. Being able to differentiate yourself from the competition is where sales are won or lost. That said, it is not impossible for defects to appear. Clearly, Toyota is suffering from that right now. GM, Ford, Honda, etc. can all experience these things from time to time too. Right now it happens to be Toyota's turn in the hot seat. Yeah, they need someone with more than just business knowledge. They need someone with vision. Someone who understands that a successful auto company is more than just building and selling cars with a certain profit margin, but offering the type of cars and the quality that will build reputation for the company and attract and retain future buyers.